It’s the last full weekend of June, so that means it’s time for San Francisco Pride weekend. Have questions? We've got you covered. The two-day event is the culmination of Lesbian, Gay, Bisexual and Transgender Pride Month, which is held in June to honor the Stonewall riots. 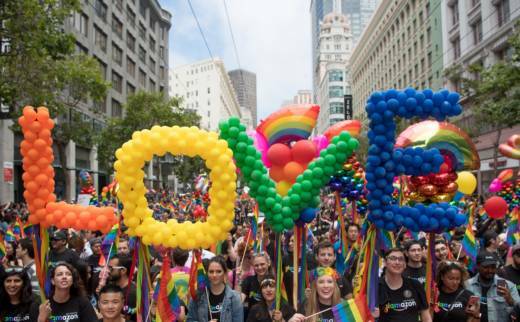 According to the SF Pride website, “the San Francisco Pride Celebration and Parade is the largest gathering of the LGBT community and allies in the nation,” which is not an understatement. At least 100,000 people are expected for the parade alone, and organizers estimate almost 1 million people for the whole weekend. Pride is made up of a lot of events happening simultaneously in the city. This year's theme is "Generations of Strength." The main events are the Celebration and Rally, and the parade. The Celebration will be at Civic Center Plaza from noon to 6 p.m. Saturday and from 11 a.m. to 6 p.m. Sunday. Donations are requested if you can make them. The event will feature speakers, performers and vendors. 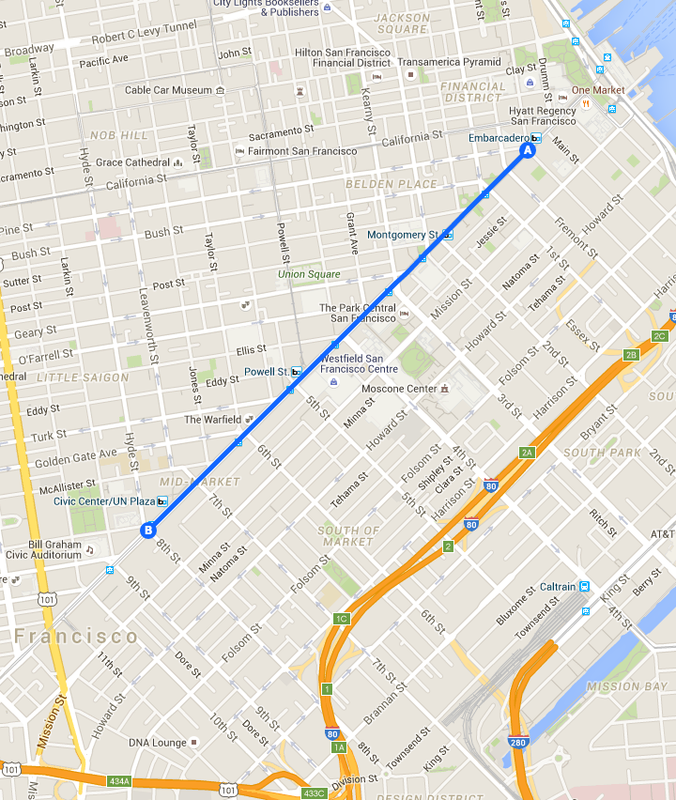 The SF Pride Parade up Market Street starts Sunday at 10:30 a.m. and runs from Embarcadero BART to Civic Center. There are 280 contingents expected, a few more than last year. "The parade is something not to be missed," said Fred Lopez with San Francisco LGBT Pride. "It will kick off with the window-rattling roar of Dykes on Bikes." This year Dykes on Bikes will be honoring founding member Soni Wolf, who recently died. There is also the Trans March on Friday and the Dyke March on Saturday. There are restrictions on what can be brought into the Celebration, so alcohol, drones and various other items will not be allowed into the space -- although booze will be sold inside the Civic Center venue by some vendors. Water will be key in keeping you hydrated if you plan to attend any of the events. Sunscreen is a must, even in foggy San Francisco. This weekend is supposed to be sunny and hit a high of 70. Attendees are discouraged from bringing bags, but if need be they cannot be larger than 18 square inches. A backup charger would also be beneficial, if not for taking great photos, then for keeping tabs on safety alerts. Civic Center Muni and BART stops will be the most direct way to get to the Celebration. Depending on where you want to view the parade, anything from Embarcadero to Civic Center Muni and BART should get you there. If you are taking Muni to the event (or anywhere downtown), you should check the reroutes schedule that will go into effect starting Friday. The reroutes will affect the 5-Fulton, 19-Polk and 21-Hayes. It's not suggested that you drive to Pride, but if you choose to do so, organizers have provided some pre-paid parking information. There will also be road closures. Streets around the Civic Center will be closed (some starting Thursday) through early Monday. The parade route up Market will also result in closures, so be prepared to reroute in order to avoid traffic and crowds (because there will be crowds). 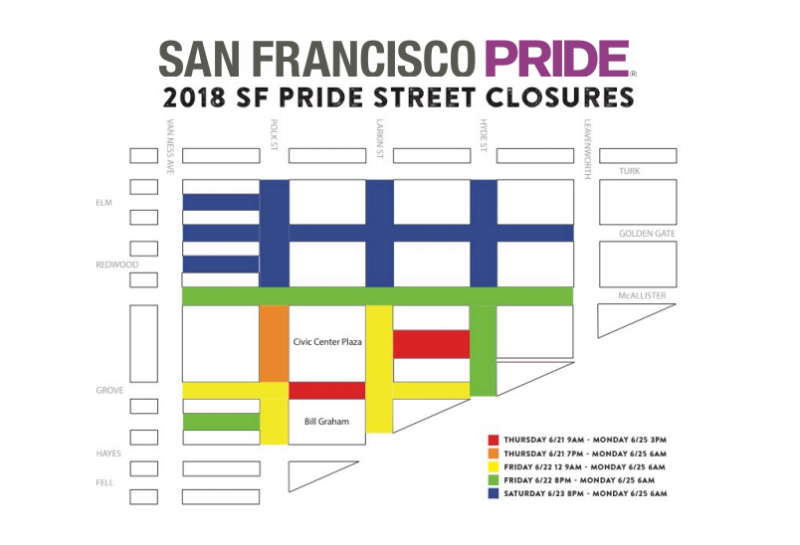 There will not be street closures in the Castro District, as there is not a big organized event there anymore, but businesses will be open that day. The San Francisco Police Department has a handy safety video for all your Pride needs. Tag @KQEDNews in your Twitter and Instagram posts and we might feature your photos and videos!